The Terra Cotta Coffehouse is the perfect place to make your new, favorite, near-by coffehouse. Located right in the middle of downtown Alfred, it is just a few minutes walk from anywhere in the town. We have several varieties of coffee, tea, chais, and a lot more. There is a deli menu, so you can enjoy sandwhiches, focaccias, or wraps along with salads, pastries, and desserts. Our food is freshly made and taste delicious! The selection of teas, iced drinks, soft beverages and other non-coffee items is extensive and unmatched anywhere else in the area. For many, the food and drink are the biggest reason to come here. Especially Tuesdays for the deal on our famous focaccias! Buy one get one half off! The menu isn't the only reason to stop in. We welcome everyone to come in and just hang out. The atmosphere is laid-back and cozy with a funky vibe to it. The interior is gorgeous and features a lot of student artwork from the local Alfred University, one of the finest ceramic schools in the world, such as our rafters lined with coffee mugs donated by their students. We have lots of seating so there is always room available to relax. We have an upstairs patio and tables out front for those that enjoy feeling the sun or breeze. 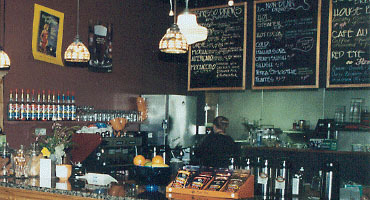 The Terra Cotta Coffehouse also hosts several evetns throughout the year. Musicians are invited to come play on open mic night. 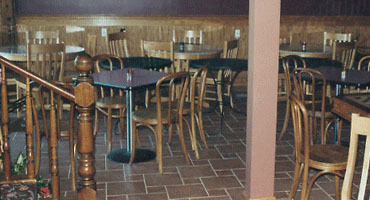 You can even reserve the upstairs for a personal party or event that you would like to have. Wether you need a respite from acedemia, or you are passing through the town, the Terra Cotta Coffeehouse is a beloved part of the town and well worth the visit!